Apr 07, 2018-Bollywood Fashion Icon Manish Malhotra to mentor Students Online. Ace Bollywood Fashion Icon Manish Malhotra is all set to share his knowledge and expertise to Indian students by being their mentor. Mr. Malhotra has joined hands with INIFD & London School of Trends (LST) to impart specialised Fashion, education and training online. This ‘Learn with Manish Malhotra’ Program shall be available from the current academic session. Now every fashion enthusiast has the privilege and opportunity to learn from the Master himself, the finest nuances of the Fashion World. Mr. Malhotra will share his experience of last 28 years in Fashion & Bollywood Movies with students through the use of technology by providing extensive video lectures and online study material. Mr. Manish Malhotra will be providing specialised lectures covering the wide range of topics from Bollywood Costumes to Bridal Trousseau and from Men’s Apparel to preparing for the Fashion Weeks. While Manish Malhotra will share his knowledge online, the Certified Faculty at INIFD Centres across India will provide the necessary skills to shape the career of budding designers. This unique blend of Fashion education will revolutionise the method of learning as students can now access the lectures of Maestro Manish Malhotra anywhere in the country with just a finger touch through a dedicated app. Mr. Manish Malhotra launched this ‘Learn from Manish Malhotra’ program in presence of INIFD Corporate Directors Ms. Ritu Kochhar, Mr. Ashok Kaushik and Executive Director London School of Trends Mr. Sunny Somra. 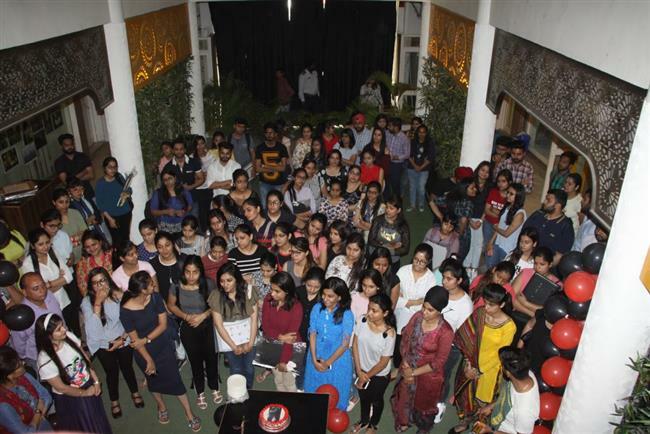 The INIFD Ludhiana students were excited about this new facility that will prove itself to be a milestone in learning the nuances of Fashion Industry from one of the most dignified fashion designers of the country and celebrated the development in the campus through lot of fun, frolic and dance.